The other night, after a fully physically exhausting day (workout with trainer, two-hour yoga practice, 3 hours of gardening, dog walk)... I was ready for a big pasta dinner. After dinner, Mr. VE&T asked "Is there anything else I can get you?" -- so I said "Yeah! Go get me those little Tofutti Ice Cream Cones." 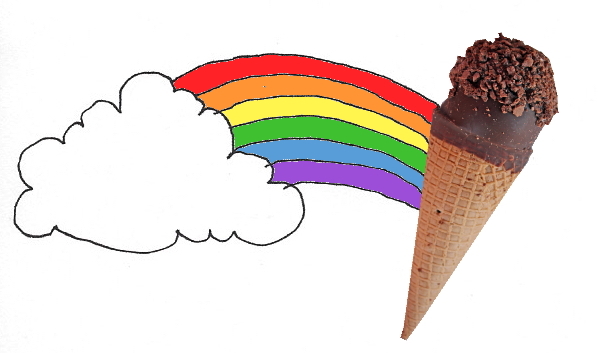 I was just joking, or fantasizing, but that sweet fella jumped right up off the sofa, drove to the store, and returned home in minutes with a box of chocolate-dipped vegan ice cream cones. Huzzah!! Boy, did we have a good time eating those little ice cream cones! In all honesty, I don't buy them all that often, but when I'm in the mood for a special treat, this is pretty much as good as it gets. Each Your's Truly cone has 220 calories, which isn't too much for such a satisfying experience. I think I love these so much because they are totally tummy-satisfying and emotionally-satisfying all at once. When I was a little girl we didn't have sweeties very often, but I loved those "Drumstick" frozen cones. Who would have ever guessed that I could still have something like this as a vegan?! As for nostalgic satisfaction, these Tofutti cones totally deliver. 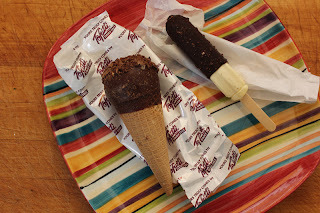 The chocolate topping has some crunchy little bits on it, which are a super fun combo with the creamy ice cream inside. And the inside of the cone is coated with chocolate, which is pretty much mandatory for a treat like this. I'm really grateful for companies like Tofutti that make such fun and tasty treats that resemble the foods I loved as a child. 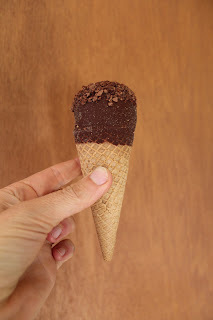 These days I eat a lot of raw veggies and protein powder and steamed kale and stuff like that -- but being able to enjoy a vegan chocolate-dipped ice cream cone like the ones I loved as a kid makes being a committed vegan feel that much easier, more rewarding, and accessible. actual ice creams sent to my doorstep! 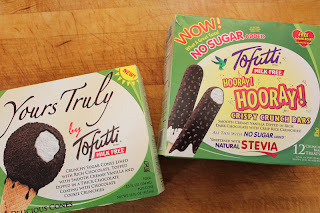 All of this got me thinking that a loooong time ago, Tofutti actually sent me some frozen treats to review and I never got around to it. It was right when some big things came up in my personal life, and I didn't have much energy for my blog. Ever since then, it has been weighing on my conscience that I received those treats and never reviewed them. Especially since I had enjoyed them so much. One of my barometers for doing reviews on my blog is whether or not I would actually buy the product again. Clearly, in this case the answer is a resounding "yes." Pictured above are the treats they sent - a box of Yours Truly cones, and some fun little sugar-free ice cream pops called "Hooray! Bars." I was skeptical of those stevia-sweetened bars, but I recall that I really liked them. If they carried those at my grocery store, I'd definitely buy them again too. My local store only carries a couple flavors of Cuties and these Yours Truly cones. 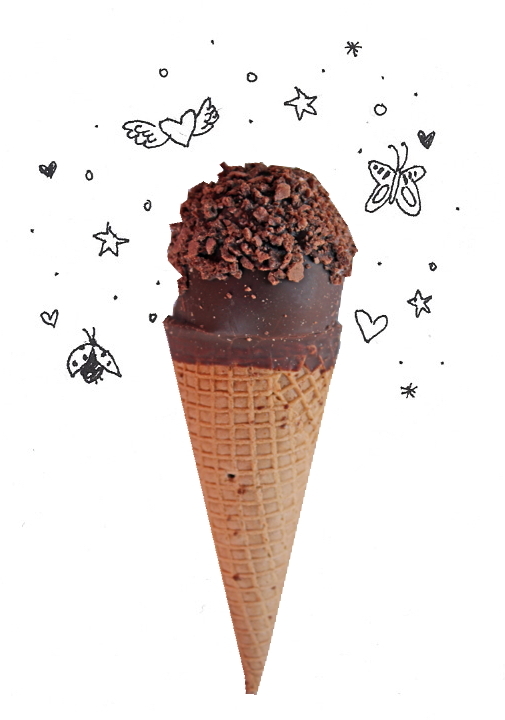 According to the Tofutti site, they make a load more of amazing-sounding treats -- a triple chocolate cone (!freak out! ), chocolate dipped ice cream bars, fudge bars (only 30 calories! ), and even coffee-flavored frozen bars! Phew. I wish I could try them ALL. That said, I feel super fortunate to have these fun ice cream cones available at a grocery store just a few blocks from my house. No complaints, for sure! How fun! I've never tried the Tofutti cones, but I'm very familiar with the Cuties. I started eating them in college, long before I ever went vegetarian or vegan. I just thought they were tasty and a good size for a treat! Like you, I have positive associations with those prepackaged cones. When I was in high school, we had a little dessert area, where you could buy frozen treats, and I bought those cones all the time. I will have to keep an eye out for the Tofutti kind. I'm sure I'd love them. Also, your doodles are especially cute in this post. That unicorn is so adorable! 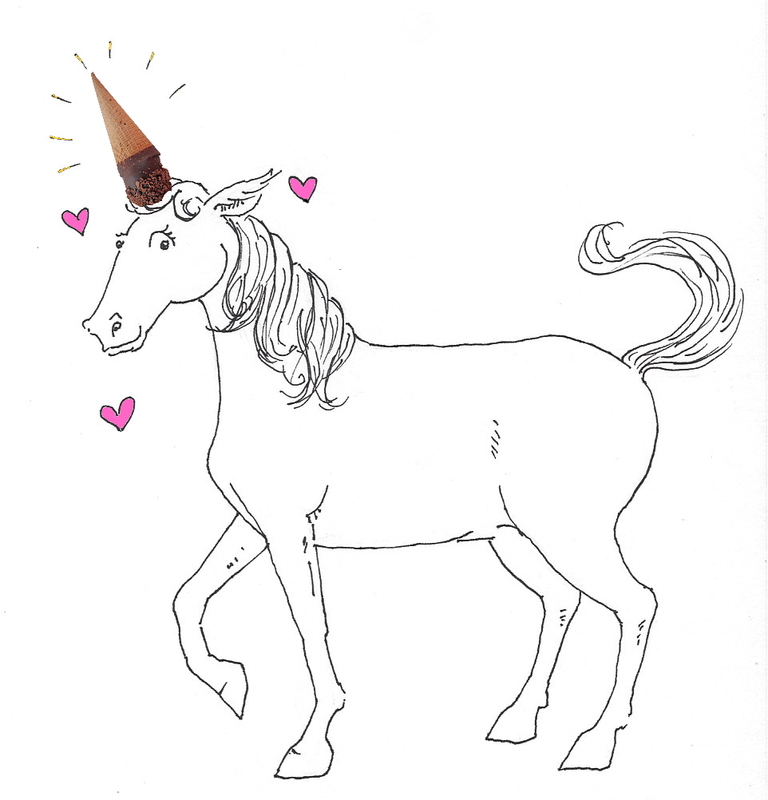 ha ha - I think the childhood associations with ice cream cones unleashed my doodle muse when I came up with that crazy unicorn. Yeah the cuties are great. Today I went to natural foods store that I don't usually shop at and saw that they had frozen Tofutti brand blintzes. I'll have to try those as well! Mr. VE&T is a KEEPER! These little treats look so yummy! Mr. Wing-It used to be obsessed with Tofutti peanut butter cookies, but unfortunately I don't think they make those anymore. 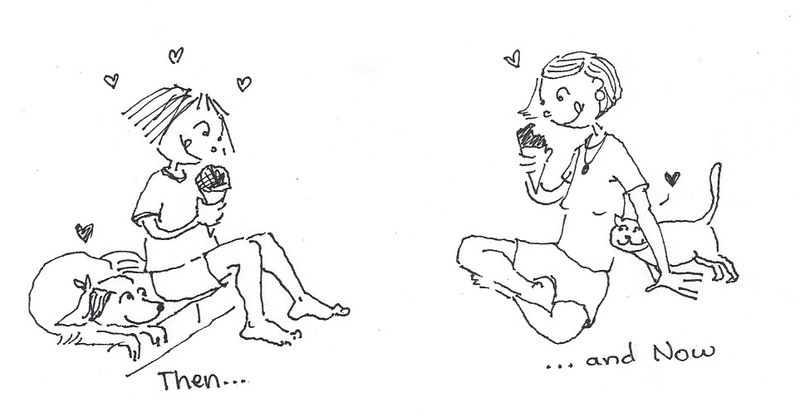 Ice cream cones really are emotionally satisfying. I loved this post and your magical unicorn with a Tofutti horn! yes, he IS a keeper! I don't think I've seen the tofutti cookies. To their credit, it looks like they are always revising their product line -- adding new things and getting rid of products that didn't catch on. yes! Have you tried the chocolate one? I wish I could find them near me. They look amazing. I love Tofutti's ice cream snacks. I am notoriuous for eating a whole pint of ice cream in one sitting, and being a vegan it isn't the worst since I might only end up eating 600 calories, as appose to Ben and Jerrys which can be like 1,000 calories in one sitting! But I like having a small cone, or sandwich that I can eat, savor, and not stuffed at the end to run and round and do something. Oh yum! I've seen these, but I have yet to try them. We used to eat Drumsticks after dinner when I would stay with my grandparents over Summer breaks. I feel like these would take me right back! they sure do live up to the name! cuties!!! Good times indeed Amey, I adore the unicorn doodle <3. Mr VE&T is such a sweetheart too and these sound like the perfect treat after a super exhausting (OMG how do you do it?) day! We get some Tofutti ice cream products here, but it can be sporadic. Also expensive due to shipping frozen stuff from the US to here! Any time there have been those cones they have sold out before I could get my hands on them! My favourite Toffuti iceblock is the chocolate-dipped flower flavoured ones. They remind me of a turkish delight kind of flavour. SO GOOD! Dang it! Now I want one!! I can't wait to let my 8 year old try these. He has never experienced the joy of the Drumstick. I hope they have these at the Nob Hill near our house!